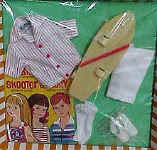 Vintage Skooter Dolls 1965-1968 - are 9 1/4" tall and were introduced in 1965, she is Skipper and Ricky's friend and shares Skipper's vintage wardrobe. 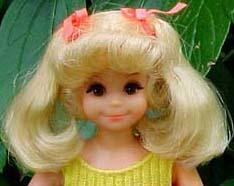 Has rooted hair styled in pigtails, painted face with freckles, came first as a straight leg doll then a bendable leg. 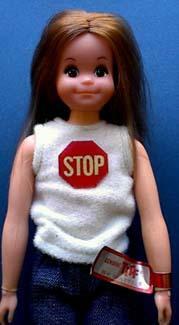 Skipper was discontinued in the USA in 1968, but still available in Europe as the Fun Time doll from 1975-1976. 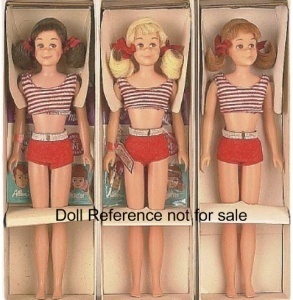 Freckled face, brown eyes, rooted pigtail styled hair with red ribbon bows, red and white two piece swim, red flat shoes, gold wire stand, comb and brush, booklet, came in a two piece cardboard box with front graphic shown on far left. 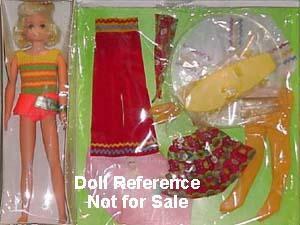 Early dolls have tan flesh tone and later dolls have a more peachy pink tone. The three hair colors available for Skooter were: brunette, blonde & titian. 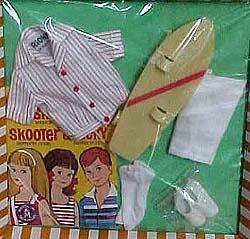 Skooter doll marking © 1963 Mattel, Inc. Hair, marking and accessories same as straight leg doll, new lime green box with clear front cello, swimsuit or shorts set in red and white polka-dot crop top with blue jean shorts, red hair ribbons, red flat shoes, white comb and brush, gold wire stand, booklet, early produced dolls have the tan skin, later they were more pink tone. Used the Skipper head mold, has dark red hair in a medium flip, blue eyes, pink skin, twist waist an bendable legs, wore a blue two piece swimsuit. 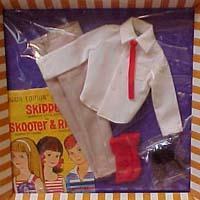 Skooter doll marking: © 1967 Mattel, Inc. U.S. Pat'd. U.S. Pats. Pend. Made in Korea. Vintage Ricky Doll & Clothes 1965-1967 - came onto the market in 1965, he is Skipper's boyfriend, has the same body style as Skipper and Skooter dolls and bears the same markings as the 1964 Skipper. BUT he does have his own wardrobe, Ricky has six outfits, plus his original swimsuit and jacket all tagged Ricky. 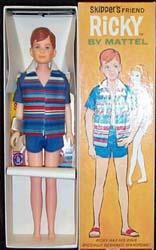 Molded red hair, blue eyes, tan skin tone, solid blue swim trunks, blue horizontal stripe jacket, collar of white terry cloth, red strap & cork sandals, "Ricky" wrist tag, liner/box, black wire stand and booklet. He has the same body mold as Skipper & Skooter and is 9 1/4" tall. 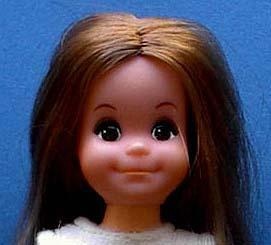 Ricky doll marking: © 1963 Mattel, Inc.
Pinker skin, rest the same as 1965. 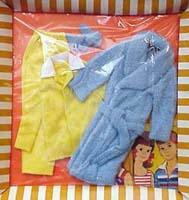 Blue terry cloth robe, patch pocket, belt and blue scuffs, two piece yellow long sleeved shirt, white collar and initial, matching pull on pants. Long sleeve white dress shirt, red skinny tie, light tan zippered slacks, red socks and black shoes. 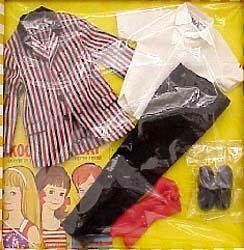 Striped blazer, black collar (same fabric as 985 Barbie's Open Road, slacks & coat lining), black zippered pants, short sleeved white cotton shirt, red socks and black shoes. Red knit shirt with blue stripe, matching red knit socks, zippered jeans, white tennis shoes, brown plastic catchers mitt, white plastic baseball, red baseball hat with a white "M" initial. White sport shirt, red and gray pin stripe cotton, white zippered shorts, white knit socks and white tennis shoes, and beige plastic skateboard with red stripe. 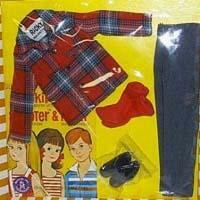 Red plaid long sleeve shirt, patch pocket, gray zippered slacks, red knit socks, black shoes. 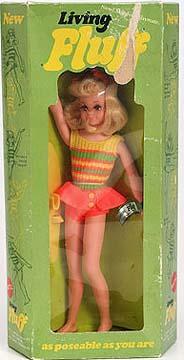 9 1/4" tall, same sized as Skipper, Skooter and Ricky dolls, part of the Barbie family of dolls, she has rooted blonde hair in pigtails, brown painted eyes with rooted eyelashes, swivel waist, bendable arms and legs, one piece swimsuit of yellow, orange and green stripe, solid orange bottom with orange vinyl skirt and a yellow skateboard. uses the Fluff face mold, with painted eyelashes. Buy, Collect, Sell or get pricing values worth for vintage Skooter, Ricky, Living Fluff and Tiff dolls, use ebay sold listings.